Eric Haseltine has applied discoveries about the human brain to his work in fields as diverse as aerospace, entertainment, and national defense. And all too often he has come up against short-term thinking that focuses on putting out fires instead of long-term thinking that can create explosive opportunities and open up new markets. Our brains have let the tyranny of the urgent stifle the pursuit of the important for too long, Haseltine says. It's time to find a way to work around our hard-wired short-term orientation in order to light that long fuse. And in Long Fuse, Big Bang, he shows how to do just that. From learning how to see through blind spots to looking to the future for revolutionary ideas, long-term thinking is the key to success-and survival-in an era of accelerating change. The essence of Long Fuse thinking is to imagine where the arc of history is going, then figure out how to take short-term steps in that direction. 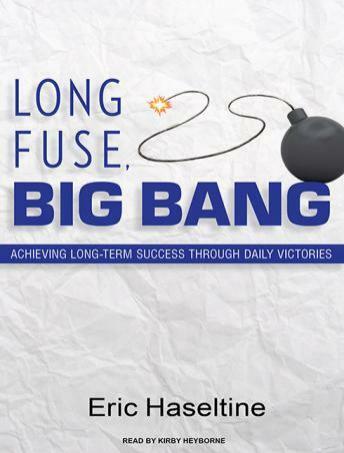 Long Fuse, Big Bang shows listeners how to apply enduring strategies in a quick-fix world, to translate long-term Big Bang opportunities into short-term projects that are in harmony, not in conflict, with our 'got to have it now' nature.